James invited me to respond to some of the challenges raised to my talk – in his summary of the event – so here it is. I’m working on a ‘show, don’t tell’ approach, leaving some of the story open to interpretation. As a result, much of the meaning of this story – and, in particular, the focus on limiting participation – depends on the audience. For example, consider the impact of the same story on audiences primarily focused on (a) scientific evidence and policy, or (b) participation and power. We know what the best evidence is, since we have produced it with the best research methods (the ‘hierarchy of evidence’ argument). We have evidence on the nature of the problem and the most effective solutions (the ‘what works’ argument). Policymakers seems to be ignoring our evidence or failing to act proportionately (the ‘evidence-policy barriers’ argument). Or, they cherry-pick evidence to suit their agenda (the ‘policy based evidence’ argument). In that context, I suggest that there are many claims to policy-relevant knowledge, policymakers have to ignore most information before making choices, and they are not in control of the policy process for which they are ostensibly in charge. Then, I say to my audience that – if they are truly committed to maximising the use of scientific evidence in policy – they will need to consider how far they will go to get what they want. I use the metaphor of an ethical ladder in which each rung offers more influence in exchange for dirtier hands: tell stories and wait for opportunities, or demonise your opponents, limit participation, and humour politicians when they cherry-pick to reinforce emotional choices. It’s ‘show don’t tell’ but I hope that the take-home point for most of the audience is that they shouldn’t focus so much on one aim – maximising the use of scientific evidence – to the detriment of other important aims, such as wider participation in politics beyond a reliance on a small number of experts. I say ‘keep your eyes on the prize’ but invite the audience to reflect on which prizes they should seek, and the trade-offs between them. I did suggest that most policymaking happens away from the sphere of ‘exciting’ and ‘unruly’ politics. Put simply, people have to ignore almost every issue almost all of the time. Each time they focus their attention on one major issue, they must – by necessity – ignore almost all of the others. For me, the political science story is largely about the pervasiveness of policy communities and policymaking out of the public spotlight. The logic is as follows. Elected policymakers can only pay attention to a tiny proportion of their responsibilities. They delegate the rest to bureaucrats at lower levels of government. Bureaucrats lack specialist knowledge, and rely on other actors for information and advice. Those actors trade information for access. In many cases, they develop effective relationships based on trust and a shared understanding of the policy problem. Trust often comes from a sense that everyone has proven to be reliable. For example, they follow norms or the ‘rules of the game’. One classic rule is to contain disputes within the policy community when actors don’t get what they want: if you complain in public, you draw external attention and internal disapproval; if not, you are more likely to get what you want next time. Should you wait for a ‘window of opportunity’ for policy change? Maybe. Or, maybe it will never come because policymaking is largely insulated from view and very few issues reach the top of the policy agenda. Should you juggle insider and outsider strategies? Yes, some groups seem to do it well and it is possible for governments and groups to be in a major standoff in one field but close contact in another. However, each group must consider why they would do so, and the trade-offs between each strategy. For example, groups excluded from one venue may engage (perhaps successfully) in ‘venue shopping’ to get attention from another. Or, they become discredited within many venues if seen as too zealous and unwilling to compromise. Insider/outsider may seem like a false dichotomy to experienced and well-resourced groups, who engage continuously, and are able to experiment with many approaches and use trial-and-error learning. It is a more pressing choice for actors who may have only one chance to get it right and do not know what to expect. Where is the power analysis in all of this? I rarely use the word power directly, partly because – like ‘politics’ or ‘democracy’ – it is an ambiguous term with many interpretations (see Box 3.1). People often use it without agreeing its meaning and, if it means everything, maybe it means nothing. However, you can find many aspects of power within our discussion. For example, insider and outsider strategies relate closely to Schattschneider’s classic discussion in which powerful groups try to ‘privatise’ issues and less powerful groups try to ‘socialise’ them. Agenda setting is about using resources to make sure issues do, or do not, reach the top of the policy agenda, and most do not. Actors engage in politics to turn their beliefs into policy. They form coalitions with actors who share their beliefs, and often romanticise their own cause and demonise their opponents. Actors mobilise their resources to encourage policymakers to prioritise some forms of knowledge or evidence over others (such as by valuing scientific evidence over experiential knowledge). They compete to identify the issues most worthy of our attention, telling stories to frame or define policy problems in ways that generate demand for their evidence. Governments have standard operating procedures – or institutions – to prioritise some forms of evidence and some issues routinely. 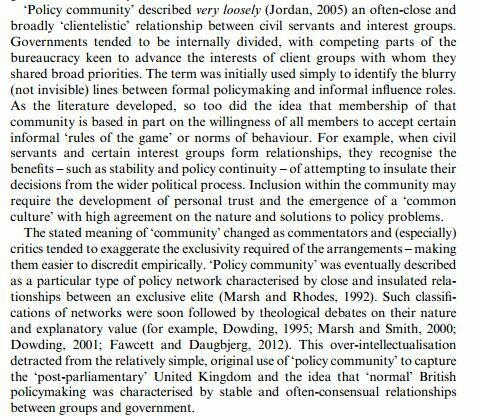 Many policy networks operate routinely with few active members. Certain ideas, or ways of understanding the world and the nature of policy problems within it, becomes so dominant that they are unspoken and taken for granted as deeply held beliefs. Still, they constrain or facilitate the success of new ‘evidence based’ policy solutions. In other words, the word ‘power’ is often hidden because the most profound forms of power often seem to be hidden. In the context of our discussion, power comes from the ability to define some evidence as essential and other evidence as low quality or irrelevant, and therefore define some people as essential or irrelevant. It comes from defining some issues as exciting and worthy of our attention, or humdrum, specialist and only relevant to experts. It is about the subtle, unseen, and sometimes thoughtless ways in which we exercise power to harness people’s existing beliefs and dominate their attention as much as the transparent ways in which we mobilise resources to publicise issues. Therefore, to ‘maximise the use of evidence’ sounds like an innocuous collective endeavour, but it is a highly political and often hidden use of power. What can you do when policymakers ignore your evidence? The first post in this series asks: Why don’t policymakers listen to your evidence? It is based on talks that I have been giving since 2016, mostly to tap into a common story told by people in my audience (and the ‘science community’ more generally) about a new era in politics: policymakers do not pay sufficient respect to expertise or attention to good quality evidence. It’s not my story, but I think it’s important to respect my audience members enough to (a) try to engage with their question, before (b) inviting them to think differently about how to ask it, and (c) provide different types of solutions according to the changing nature of the question. This is me presenting those slides in Cambridge while being very Scottish, enjoying a too-heavy cold, and sucking a lozenge. Please note that I tend to smile a lot and make many sarcastic jokes while presenting, partly to apologise indirectly for all the self-publicity. Why don’t policymakers listen to your evidence? I tend to provide three main answers. Few policymakers know or care about the criteria developed by some scientists to describe a hierarchy of scientific evidence. For some scientists, at the top of this hierarchy is the randomised control trial (RCT) and the systematic review of RCTs, with expertise much further down the list, followed by practitioner experience and service user feedback near the bottom. Yet, most policymakers – and many academics – prefer a wider range of sources of information, combining their own experience with information ranging from peer reviewed scientific evidence and the ‘grey’ literature, to public opinion and feedback from consultation. While it may be possible to persuade some central government departments or agencies to privilege scientific evidence, they also pursue other key principles, such as to foster consensus driven policymaking or a shift from centralist to localist practices. Consequently, they often only recommend interventions rather than impose one uniform evidence-based position. If local actors favour a different policy solution, we may find that the same type of evidence may have more or less effect in different parts of government. Many scientists articulate the idea that policymakers and scientists should cooperate to use the best evidence to determine ‘what works’ in policy (in forums such as INGSA, European Commission, OECD). Their language is often reminiscent of 1950s discussions of the pursuit of ‘comprehensive rationality’ in policymaking. The key difference is that EBPM is often described as an ideal by scientists, to be compared with the more disappointing processes they find when they engage in politics. In contrast, ‘comprehensive rationality’ is an ideal-type, used to describe what cannot happen, and the practical implications of that impossibility. The ideal-type involves a core group of elected policymakers at the ‘top’, identifying their values or the problems they seek to solve, and translating their policies into action to maximise benefits to society, aided by neutral organisations gathering all the facts necessary to produce policy solutions. Yet, in practice, they are unable to: separate values from facts in any meaningful way; rank policy aims in a logical and consistent manner; gather information comprehensively, or possess the cognitive ability to process it. Instead, Simon famously described policymakers addressing ‘bounded rationality’ by using ‘rules of thumb’ to limit their analysis and produce ‘good enough’ decisions. More recently, punctuated equilibrium theory uses bounded rationality to show that policymakers can only pay attention to a tiny proportion of their responsibilities, which limits their control of the many decisions made in their name. More recent discussions focus on the ‘rational’ short cuts that policymakers use to identify good enough sources of information, combined with the ‘irrational’ ways in which they use their beliefs, emotions, habits, and familiarity with issues to identify policy problems and solutions (see this post on the meaning of ‘irrational’). Or, they explore how individuals communicate their narrow expertise within a system of which they have almost no knowledge. In each case, ‘most members of the system are not paying attention to most issues most of the time’. This scarcity of attention helps explain, for example, why policymakers ignore most issues in the absence of a focusing event, policymaking organisations make searches for information which miss key elements routinely, and organisations fail to respond to events or changing circumstances proportionately. In that context, attempts to describe a policy agenda focusing merely on ‘what works’ are based on misleading expectations. Rather, we can describe key parts of the policymaking environment – such as institutions, policy communities/ networks, or paradigms – as a reflection of the ways in which policymakers deal with their bounded rationality and lack of control of the policy process. Scientists often appear to be drawn to the idea of a linear and orderly policy cycle with discrete stages – such as agenda setting, policy formulation, legitimation, implementation, evaluation, policy maintenance/ succession/ termination – because it offers a simple and appealing model which gives clear advice on how to engage. Indeed, the stages approach began partly as a proposal to make the policy process more scientific and based on systematic policy analysis. It offers an idea of how policy should be made: elected policymakers in central government, aided by expert policy analysts, make and legitimise choices; skilful public servants carry them out; and, policy analysts assess the results with the aid of scientific evidence. Yet, few policy theories describe this cycle as useful, while most – including the advocacy coalition framework , and the multiple streams approach – are based on a rejection of the explanatory value of orderly stages. Policy theories also suggest that the cycle provides misleading practical advice: you will generally not find an orderly process with a clearly defined debate on problem definition, a single moment of authoritative choice, and a clear chance to use scientific evidence to evaluate policy before deciding whether or not to continue. Instead, the cycle exists as a story for policymakers to tell about their work, partly because it is consistent with the idea of elected policymakers being in charge and accountable. Some scholars also question the appropriateness of a stages ideal, since it suggests that there should be a core group of policymakers making policy from the ‘top down’ and obliging others to carry out their aims, which does not leave room for, for example, the diffusion of power in multi-level systems, or the use of ‘localism’ to tailor policy to local needs and desires. Forthcoming special issue in Policy and Politics called ‘Practical lessons from policy theories’, which includes my discussion of how to be a ‘policy entrepreneur’.